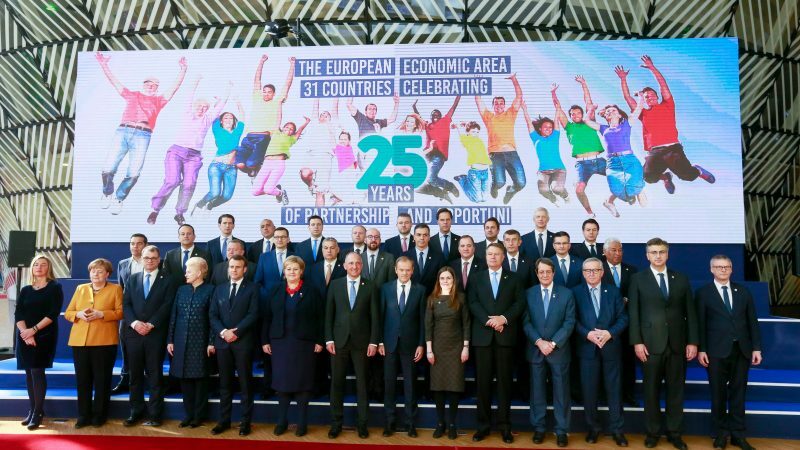 Only hours after intense Brexit negotiations on a delay to the UK’s exit date, EU leaders on Friday (22 March) celebrated the 25th anniversary of the European Economic Area (EEA) agreement on joint legislation on movement of goods, services, persons and capital. “Within the EEA, more than 500 million people are free to move and travel, to do business and invest with ease, to receive an education, conduct cutting-edge research abroad, while enjoying the safest consumer protections, the highest standards at work and the cleanest environment,” said EU Council President Donald Tusk in Brussels after EU leaders had a joined session to mark the 25th EEA anniversary. The EEA is the common market founded in 1994 between the 28 EU member states plus Norway, Iceland and Liechtenstein. “We have accomplished this through shared pragmatism, and in a spirit of neighbourly cooperation. And we should never take this for granted,” Tusk said in his speech in front of reporters. “We must maintain our citizens’ trust in European cooperation,” Norwegian Prime Minister Erna Solberg echoed Tusk’s remarks in Brussels, while Iceland’s Prime Minister Katrín Jakobsdóttir stressed the benefits of her country’s cooperation with the EU. Asked whether she would welcome the UK into the European Free Trade Association (EFTA), Jakobsdóttir said that the members “would be happy to talk about that if that is something the UK wants to talk about”. However, she was quick to point out that the four EFTA states – Norway, Iceland, Liechtenstein and Switzerland – had to abide by the EU’s four freedoms, including freedom of movement, the abandoning of which has been one of the main ‘red lines’ in the UK’s Brexit negotiations. Only a couple of days before on Monday (18 March), Norway and Iceland agreed a temporary agreement with the United Kingdom on trade in goods should the Britain leave the EU without a deal. “It is very positive that we’ve reached an agreement that regulates the basis for the Norwegian business sector to continue its trade in goods with the UK even if there is a no-deal Brexit, said Minister of Foreign Affairs, Ine Eriksen Søreide. So far, very few countries have an agreement of this kind with the UK. The agreement will continue to cover provisions on trade in goods currently governed by the EEA Agreement. All current tariff preferences, including zero tariffs for manufactured goods, will be retained. Duty-free quotas for seafood and agricultural products continue to apply. The agreement does not include collaboration on technical regulations (TBT) or health safety regulations. However, London has stated that it will accept the importation of goods from companies in Norway and Iceland that have been authorised for a limited period of time for export to the EU. A permanent agreement on these matters is yet to be found. For the UK side, the deal would ensure continued access for British businesses to the European Economic Area (EAA) should the country leave without a deal, UK International Trade Minister Liam Fox said in a statement earlier this week. “This is one of the largest trade agreements we are party to as a result of our membership of the EU,” he said. The agreement provides a basis for the negotiation of a permanent agreement to ensure that the open trade agreements that constitute the internal market, including the provision of services, are continued as far as possible. In recent weeks, Norway has already signed bilateral agreements with the United Kingdom on air and road transport. “Although it is pure coincidence that the EU marks 25 years of the EEA during this summit, to May it must feel like a jab – á la ‘look what you could have had’ as she had to attend this meeting this morning,” an EU official told EURACTIV when asked about the mood the Brexit all-nighter had left EU leaders with.